Circus arts often appear in my writing projects. 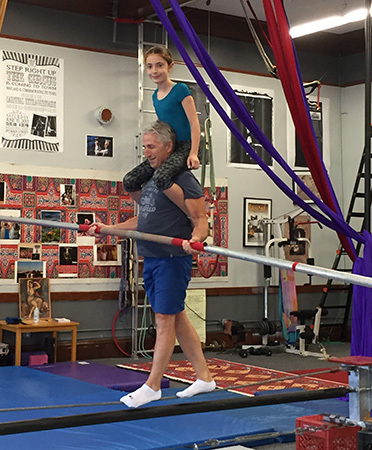 My fascination with circus began when my family and I went to see a Circus Smirkus performance; we all fell in love with circus arts—high wire, aerial arts, acrobatics, juggling, and more. 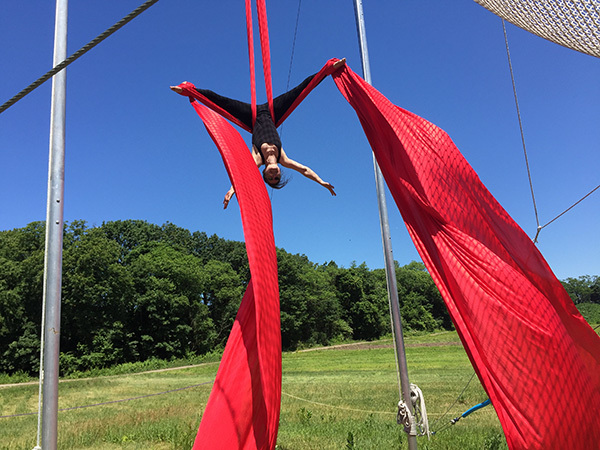 Circus Smirkus is a youth circus troupe that tours the New England region during the summer. They also offer summer camp for children of all ages (and adults!) in Vermont. Circus Smirkus is an animal-free acrobatic circus like Cirque de Soleil and other modern acrobatics circus troupes such as Machine de Cirque and 7 Doigts de la Main. 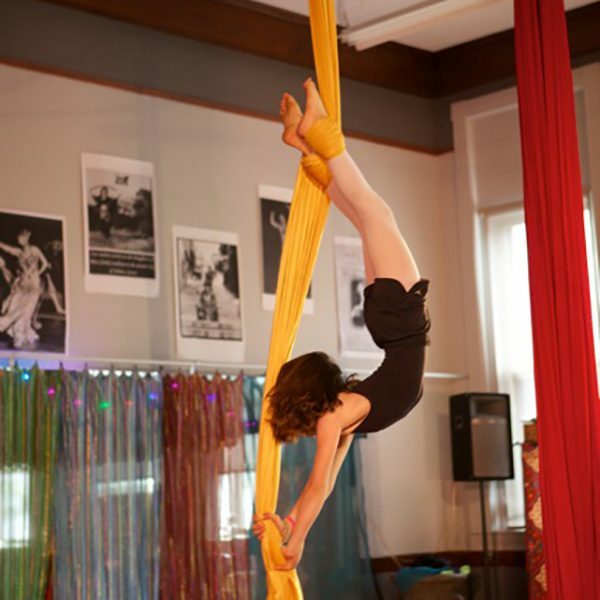 Many cities have circus gyms where you can learn circus arts. As soon as we saw Circus Smirkus, we knew we had to try! My daughters and I have been taking classes for several years and have discovered that aerial silks is our favorite activity. To practice aerial silks we go to a circus studio, Moody Street Circus, run by the wonderful and talented Melinda and Sacha Pavlata. For tightwire practice we set up a wire in our living room. The outdoor photos were taken at Revolution Trapeze, where we were practicing aerial silks outside with our amazing instructor, Molly Baechtold. I hope you will be inspired to try a circus art, too. You can start with juggling balls in your backyard. 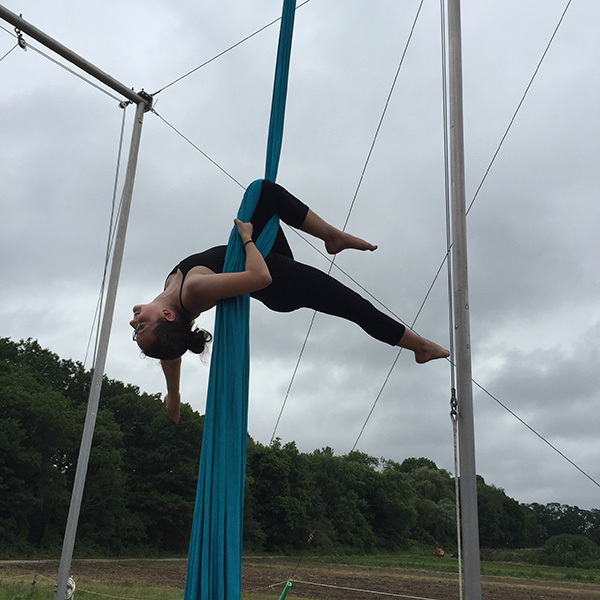 My older daughter, dangling upside-down on aerial silks. Me! Just hanging around on aerial silks. Sacha Pavlata, circus artist extraordinare, walking across a wire with my daughter on his shoulders! Circus tent at Circus Smirkus Summer Camp in Vermont. Doesn’t it make you want to run away with the circus? !